We were planning on climbing Mt Rainier this weekend and then decided not to. Here’s why. 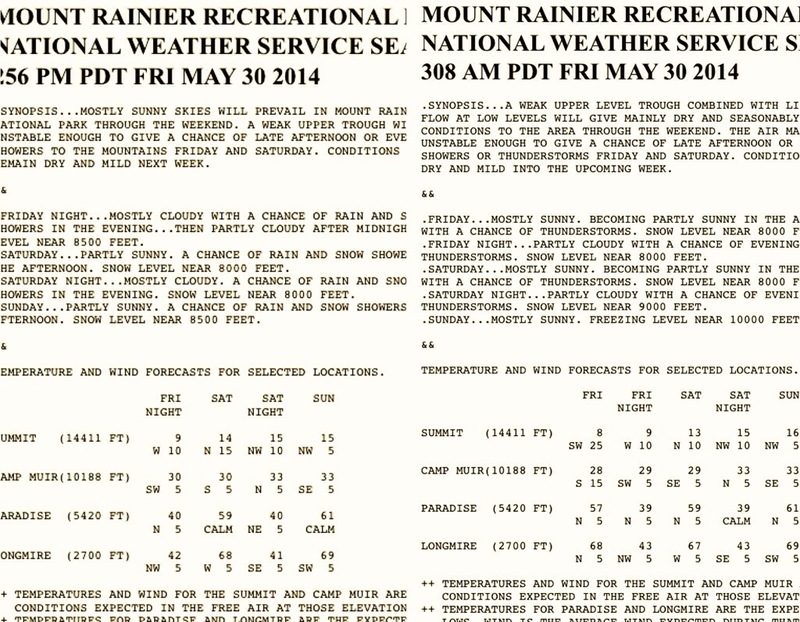 Hidden in the small text changes between the forecast right now (left) and the forecast earlier this morning (right) is the information that the conditions are slightly worse than they initially thought. For optimal climbing conditions – you wanna catch a positive trend in forecasting, not a negative trend. So we’ll likely delay our summit attempt to a later window. The concerning detail is that 2 days ago it was supposed to be sunny on Sunday. Last night they predicted thunderstorms on Sunday. This afternoon they are predicting snow showers on Sunday. Even though each prediction is a “slight” chance, cumulatively it points to a larger negative trend that makes it smarter to avoid from a mountaineering risk analysis perspective.